Living… on Earth. Although Jason once played the role of a daring space commander, he actually lives on Earth and tries to keep up a life of luxury complete with limos and drunken parties. Visiting… outerspace, on a spaceship that seems oddly familiar. Jason has recently found himself and his friends transported aboard a spaceship, far away from Earth. Profession… TV actor. Jason starred in the space-drama Galaxy Quest where he played Peter Quincy Taggart, the commander of a spaceship called the NSEA Protector. However, the days of the show are long gone since the show was cancelled eighteen years ago, and now Jason spends his time reliving the glory days. Relationship Status… single. Jason claims to have slept with all of the female actors who appeared on the show, though nobody is really sure how much of that is true. He has yet to bed his fellow crew member Gwen DeMarco, however, despite the hopes of the fans who would love to see them together. Challenge… saving an alien race from destruction. 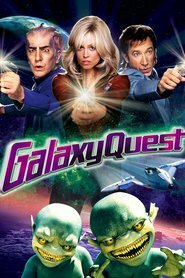 When aliens called the Thermians arrive from outer space in danger of destruction by an alien warlord named Sarris, they contact the members of the Galaxy Quest crew believing that they are actually space heroes. Thinking it’s just another gig with avid fans, Jason and his crew agree to go with the Thermians, but find themselves teleported onto an exact replica of NSEA Protector from the show with real, live aliens. Now the gang of simple TV actors must make their roles a reality, along with the help of an expert fan Brandon, in order to save the Thermians from extermination. Personality… egotistical, confident, and inept. Jason likes to think that he carries a swaggering air of bravado, but he’s adored only by his nerdy and awkward fans. He’s typically late to everything, and he never misses a moment to remove his shirt and show off. And although he succeeds in every episode of Galaxy Quest, in reality he’s pretty bumbling and useless at handling the sorts of emergencies one would find in space. Jason Nesmith's popularity ranking on CharacTour is #3681 out of 5,000+ characters. See our top-ranked characters and read their profiles.